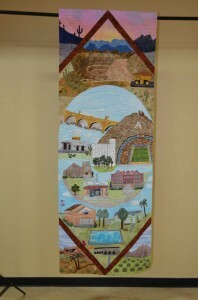 The 100 quilters selected to be part of the Arizona Historical Society‘s state centennial exhibition started bringing their work to the Tucson branch this week. 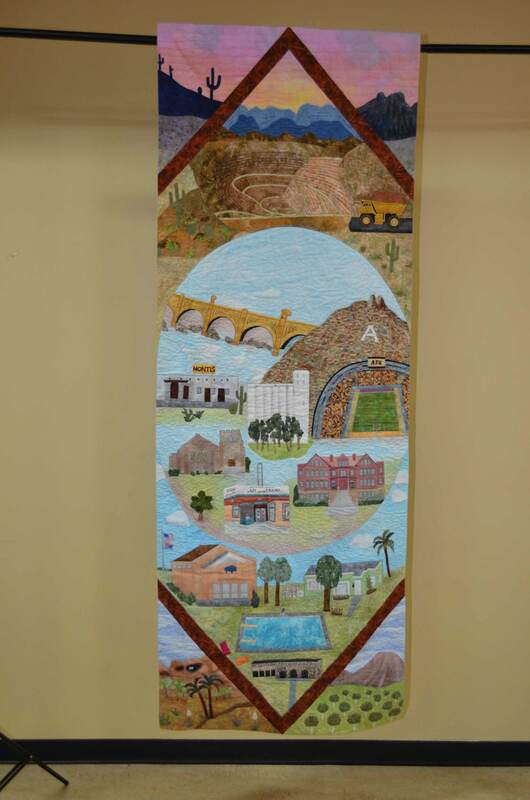 On September 9-10, AHS’s Tucson staff will be receiving selections from roughly 40 quilters. On September 15-16, the process will continue at the Tempe historical society branch, followed by a third group of intakes in Prescott, Arizona Sept. 23-24. Daniel Buckley is videotaping the intake process and photographing each of the quilts, along with its maker (when available) for a series of video products associated with the February, 2012 show. ~ by Daniel Buckley on September 9, 2011. Hello Evelyn, from a friend a long time ago, (6th Grade). Your beautiful quilt is absolutely gorgeous, and I certainly appreciate and respect not only the beauty, but the accuracy of what it represents to all Arizonans. It has been over 59 years ago, and I hope to see you again, at the double nickel reunion. Keep up the great, outstanding work, and you should be listed in the Hall of Fame for Quilters. Call me.